In today’s world, where people are more accustomed to doing things electronically, mailbox installation in Sterling Heights, MI can be a very rare act. However, if you are one of those people who still values traditional ways of mail communication, you should have a mailbox in your home. Not only is it practical if you want to avoid paying monthly dues for renting private mailboxes in Sterling Heights, MI but it will also ensure that your mails are protected from different weather condition and possibility of being lost. Mail Safety – If you get a mailbox installation in Sterling Heights, MI, you will have the assurance that your mail is safe. Not only will the mail be protected from damage caused by changing weather or harmful elements but also safe from thieves. You can have your mailbox installed with a locking system to ensure that only you can access it. 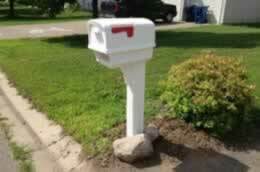 Aesthetic Appeal – Sterling Heights, MI mailbox installation at your home can provide an aesthetic appeal. You can design it to be the focal point of your property’s facade. A beautiful mailbox can enhance your curb’s view from the streets. Cost Saving – Having your own home mailbox installation in Sterling Heights, MI saves you money from renting costly private mailboxes. You can get the same benefits of private mailboxes at the comfort of your own property.